PROVO (AP) — A young woman convicted in a 50-mile crime spree that left one Utah sheriff’s deputy dead and another wounded was sentenced Wednesday to 30 years to life in prison with the possibility of parole. State Judge Darold McDade handed down 18-year-old Meagan Grunwald’s term following emotional testimony about the January 2014 chase from the injured lawman. 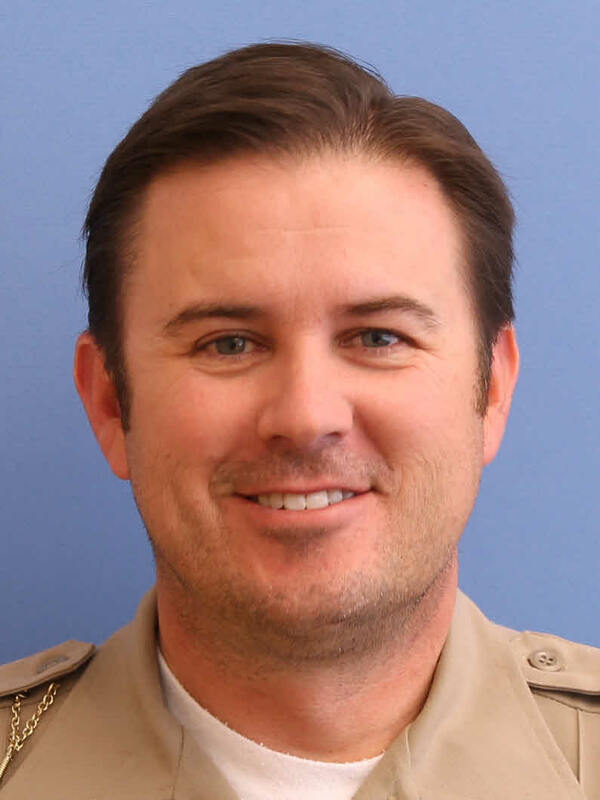 Utah County Sheriff’s Deputy Greg Sherwood told the judge that after he was shot in the head and fighting for his life in his police cruiser, Grunwald drove past him without stopping to help. Grunwald cried during the hearing as she read quickly from a brief written statement. “It’s hard for me to ask for forgiveness when I have a hard time forgiving myself,” she said. Grunwald will get credit for the year and half she already has served behind bars in jail. At the earliest, she could be released in 2044, when she’s 47 years old. Prosecutors said Grunwald was a willing accomplice ready to do anything to stay with her 27-year-old boyfriend, including driving a speeding getaway car in the three-county chase. 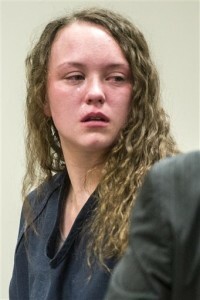 During her trial, the teenager tearfully told a jury she was afraid to stop driving when the man she loved turned the gun on her and threatened to kill her family. The boyfriend, Jose Angel Garcia-Jauregui, was killed in a shootout with police. Grunwald was convicted in May of 11 counts, including aggravated murder, attempted murder, aggravated robbery and use of a controlled substance. She was found not guilty on one count of attempted aggravated murder. The maximum penalty Grunwald could have faced was life in prison without parole. She was ineligible for the death penalty because she was 17 when it happened. She was charged and convicted under Utah laws that allow an accomplice to be considered equally responsible for a crime. Utah County Sheriff’s Sgt. Cory Wride, 44, was killed during the crime spree. Wride’s widow, Nannette, said his family wanted Grunwald to have a chance at parole because she’s young and might make something of herself. “I’m going to be rooting for her to be someone better,” Nannette Wride told reporters. Before Grunwald was sentenced, Wride addressed the crying teenager in court. “You are forgiven, and I hope, sweet girl, that one day you can forgive yourself,” Wride said as Grunwald put her head down and sobbed. The shootout and chase came after Cory Wride happened upon the couple’s pickup on the side of a road. Garcia-Jauregui had a warrant out for his arrest and gave the deputy a fake name. When Wride grew suspicious, Garcia-Jauregui stuck a gun out the truck’s rear window and shot the deputy as he sat in his police cruiser. Grunwald’s lawyer said she was a scared girl who trusted an older, manipulative man. Attorney Dean Zabriskie said as the couple fled from police through three central Utah counties, Grunwald was driving with a gun to her head. Zabriskie said Wednesday that Grunwald survived her time in the truck because Wride stopped to help her, and she considers him her savior. Zabriskie said Grunwald plans to appeal her conviction. Girls always like the badboys. Was he even legal though? That made my day. I’ll look for her in future episodes of Orange is the New Black. I wonder if she cried because she was contrite or because she got 30 years? Probably because she got 30 years. More lives ruined needlessly by unenforced immigration laws. I’m sure Anybody Home and other bleeding hearts will be starting a fundraiser for her soon (isn’t that how the joke goes around here?). The current (and previous!) administrations immigration policies are directly responsible for this officers death, because if the killer hadn’t been in the country illegally it wouldn’t have happened. Break any single link in the chain of events leading up to a crisis and it’s averted. According to the SLTrib, the killer was US citizen who had been recently released from prison. He had a warrant out for his arrest after breaking parole. Just because he had a Hispanic name is no reason to assume he was illegal. I think this story is a complete tragedy; the officer’s death, the injuries to the other officer and the very young girl with her life ruined. I agree with you Karens about the last name. We need to stop pointing fingers and name calling in this country. This was a terrible act by a bad man just like the shooting in South Carolina was a terrible act by a wicked person. Can’t we just say bad person, horrible actions and then punish the person who did the act and leave it at that? Why attach all kinds of politics to it? A flag doesn’t kill people nor does a green card or a last name or the color of someone’s skin. Why don’t we spend more time (our own time) helping people be better people where we can and when we can. That is the best solution. Thank you priests, bishops, ministers. cub scout and boy scout leaders. teachers and Sunday school teachers people who volunteer in community youth programs and sports programs etc. Make your own list. I agree wholeheartedly with you BRIAN. I meant Native Born New Mexican. I can’t agree with anything BRIAN said. My mistake. Whoa, Brian…don’t take my name in vain. And don’t generalize what I think. Personally, I think she deserves punishment for her part in all this, but I don’t like your attitude of name calling and ill-founded accusations. It’s an attitude way too prevalent in southern Utah.